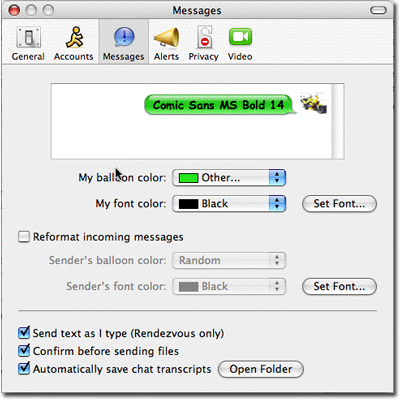 This information is in addtion to setting the Bubble or (Plain Text) background colour of an IM that is sent set in the iChat Menu > Preferences > Messages pane. In addition to this the View menu can change between Bubble View and Text View. Method 1. is self explanatory in that you go to the iChat Menu > Preferences and highlight/select the Messages Pane. From there you use the relevant Buttons and Drop downs to select the Font (Style/type), the Font Colour and the Bubble colour that you want to be seen as your Outgoing style. If in the View Menu you have choosen the Text view option the colour choosen for th Bubbles will be a background colour. In choosing colours go for Light on Dark or Dark on Light to get the text to Stand out and use opposing colours, roughly Yellow with Blue, Green with Red and Magenta/Purple with Orange. See this example of two colours of Text on 216 coloured squares. We are talking here of basic 6 colour Printing techniques. (Of course there are exceptions). You know most other people will have it. That your friends and family can read it. That the size works for them at their end as well as you at yours. This free Font Site has a sample Text entry field where you can test the font. Smileys are very common now. Most people know the basic Keystrokes to create their text based impression in an email or posting on a Discussion Forum. In fact the Apple Discussions recognise when people type :-) and convert as it is posted in to a picture like this (In fact the complete range can be accessed here) and are very close to the iChat ver 1 and 2 ones. 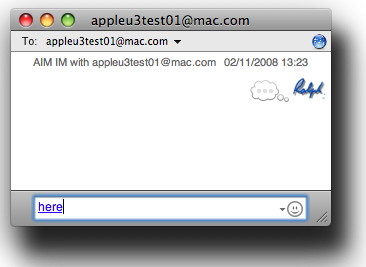 In iChat 2 the buttons that iChat 1 had to do some formatting including adding smilies has gone. To Insert an Smiley there is now a grey option button and the end of the Text Entry field and another option in the View Menu to do the same. 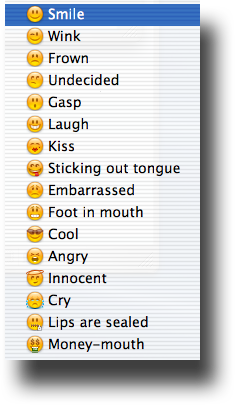 I will let you play to discover which keystrokes create which Smiley. iChat coverts the Text version as you press enter and sends a Smiley as well as it being displayed as such in your Window/Bubble. Sending what you type or have Copied and Pasted is done by hitting the Enter key. If you Copy & Paste there is a limit to the amount of Text that can be sent in one go. Also the Text Entry field will now expand to view all (most, if you Paste a large block) that you enter. Plain URLs and text converted to a Link can also be sent. At one time there was some abuse of this so sending plain URLs can be better but it is still worth changing longer ones. You do this by highlighting a word then use the item in the Edit Menu which brings up a Dialogue box to enter the full URL into. 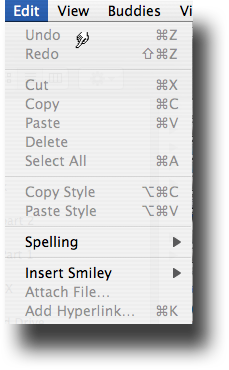 If you just use the item in the Edit menu iChat will substitue the word "here" for you. (See also the picures on the right). The greyed out Smilie at the end of the line is the option Button to Include one. It will produce a Pop out Drawer and as you mouse over them it will display the Keystrokes you could use. Some options can only be used on selected Text. Choose a Bubble Colour you like. If it is Dark, tend towards a lighter Font Colour. 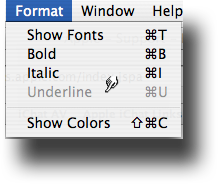 If Light, tend toward a Dark Font Colour. Use a more common Font that many people will have and use and pay attention to it's readability. 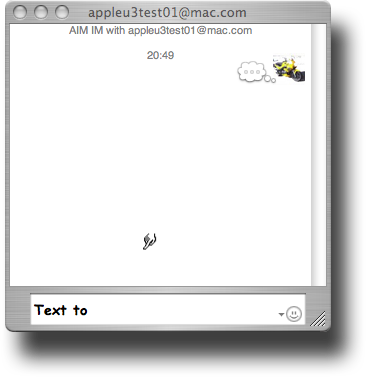 In iChat 2 and onwards the Text field will expand to include everything you type or Paste to the field. However there is a limit to the amount of characters it will hold of about 250 words or so. You will notice that the Edit Menu has the Option to make a highlighted word become a Hyperlink with the Keystroke option of Apple Key ( or ⌘) and the K key. If you use Apple+k or the option in the menu without having highlighted a word iChat will substitute the word "here" for you. In 1-1 Text chats, as you or your Buddy types, Thought Bubbles appear along side the Buddy Pic (if displayed) to indicate something will be coming or sent soon. Having started a Text Chat the next step you may want to consider is formatting the chat with different colours and fonts. This includes adding Smilies to the Chat as you go and whether to use the Standard Speech Bubbles or plain text. This section has the info on how to actually send that IM when typed and formatted. I also note that the Speech Bubbles appear when you or your Buddy are getting ready to send something.